psssssst! Meet me in the Alpaca Barn! The Black Sheep Gathering at the Linn County Fairgrounds, Albany, OR. Alpacas will be joining the sheep and goats at the Black Sheep Gathering at their new venue: the Linn County Fairgrounds in Albany, OR. If you are not familiar with BSG, it is one of the premier fiber events in the country. Visitors come from all over North America, taking classes, entering their wool and mohair in the flece show, showing sheep and goats, and packing the halls to buy fleece, roving, yarn, and animals. Knitters, hand-spinners, felters, and weavers search for raw material for their next projects, and everyone enjoys the animals, fiber demonstrations and competitions, and colorful displays. We are now accepting applications for BSG alpaca pens and farm display booths in the animal barn. If you're curious about the fee structure, we want to encourage exhibitors to bring alpacas. 10x20 spaces have room for your own 8 or 10 foot alpaca pens, plus product sales and farm displays. If you don't have your own panels, let us know, and we will try to find a source from whom you can borrow. We can no longer sell raw fleece in our vendor spaces; it has to be sold through the Black Sheep Gathering's Fleece Show & Sale, just as is done with all sheep and mohair fleeces at BSG. We can sell processed fleece and products in our barn area. Processing can be as minimal as washing or carding. There is a $6 entry fee and a 10% commission on fleece that sells (fleece may also be shown and marked “not for sale”). The Fleece Show will strongly promote the sale of fleeces, and can assist if multiple buyers are interested in splitting a fleece. Whether for Show and/or for Sale, the entry list of fleeces must be postmarked by June 7th. Fleece check-in is Check-In is Thursday, July 4th, 1:00-8:00 p.m. and Friday, July 5th before 9 a.m. There are NO Mail-in Entries. When available, the BSG Fleece Show Registration will be an editable PDF for you to fill out on your computer, print, and send in with your check (address at the bottom of form). The format is "open judging" where the audience may observe and ask minimal questions. 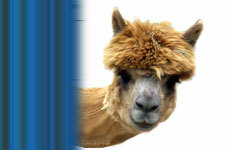 Alpaca fleece judging will be announced in the vendor hall and barns, most likely early on Saturday afternoon. The Fleece Judge this year is Zane Bone from College Station, Texas. The judging is 'open style' ~ you may sit and listen to his comments as he evaluates each fleece. If you would like to help, AAWO needs volunteers at the BSG Wool Show (fun and a great learning experience), in our demonstration area, setting up our barn area, putting out signs, in the Spinner's Lead, etc.